Comment Backlinks are one of the most famous and easy links to build for any blog. While they are comparatively less beneficial than the links you get from some other techniques such as guest posting or broken link building, they are certainly useful in ranking. However, without knowing the right technique, you can build as many comment backlinks as you like and they won’t benefit your blog in any way. That’s why today we have brought this guide explaining how to build comment backlinks – the right way. In simple words, comment backlinks are basically the backlinks which are build by commenting on various blogs. You must have seen a lot of blogs include a field to enter your website URL alongside other fields such as your name or email address in the comment section. Normally when you leave a comment and enter your website’s URL in the website field, your name which appears with your comment on that page gets linked to your website giving you one backlink from that page. Regular Comment links – The links we explained in this post earlier are pretty much the resemblance of regular comment backlinks. These are the backlinks you can get by adding your site’s URL in the website field and these links are associated to your name. Some sites also use plugins such as Disqus for controlling spam which only makes this process easier. You can just sign up once at Disqus’ website, add your site’s URL in your profile and then whenever you comment on a site which has disqus installed, you automatically get a comment backlink from that page. Anchor Text or HTML enabled comments – The second type of comment backlinks are the links you can get from within the actual comment instead of your name and with an anchor text. It becomes possible because some sites allow you to use HTML tags within the comments. Using those HTML tags, you can use an anchor text of your choice for the comment you are going to leave. Such links are especially useful when you are trying to rank any specific page for a specific keyword as you can get a link with your Keyword as anchor text. 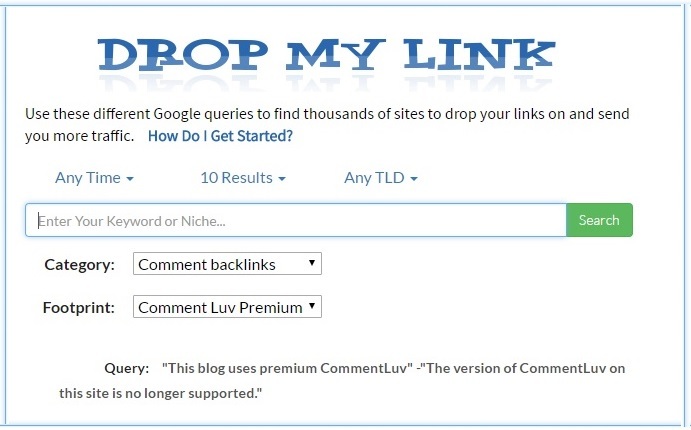 CommentLuv enabled links – We talked about how Disqus is a plugin used for comments previously, similarly there is another plugin named CommentLuv which is used by bloggers to attract comments on their posts. CommentLuv allows you to link your name in the comment to any specific page or post from your blog. This is again especially useful when you are trying to build links for a specific page to increase its authority and rank it for a specific keyword. How to build quality comment backlinks? 1) Relevancy – As any other backlink, the relevancy of the page and the whole blog from which you are getting a link is very important. The blog you are getting the link from should be in the same niche as yours and it’s even better if it matches with the main subject of your blog. 2) Authority – Again, authority of the site is an important factor which decides how much a backlink will be beneficial for you. Normally a site with more than 30 DA is good though occasionally you can build links from sites with lower DA as well if you are doing it for Micro Niche blog and they are highly relevant. Overall the relevancy of the site is the biggest factor. If you are getting a link from a lower authority relevant blog than it’s often better than higher authority non-relevant blogs. 3) Do follow link – While most of the comment backlinks are no follow there are still some blogs which offer a Do Follow comment backlink. If you are working on a micro niche blog, it’s generally better to work hard and find blogs offering a Do Follow comment link than getting tens of No Follow Links. 4) Outbound links – Like any other kind of links, the number of outbound links or the number of links a page is giving to other sites affect the quality of the link you are getting. So try to build links from posts which have fewer comments and avoid any post which has more than 50 comments. 5) Text around your link – This is something which is often overlooked by people. The density and contexuality of text just around your link matters very much in determining the quality of your link. So instead of leaving a comment with little to no text such as ‘Good Post’ ‘Nice Read’ etc, you should actually read the post and try to write at least 2-3 lines in the comment which also includes words related to your own niche. How to find blogs to build comments backlinks? Now as you have learned enough about comment backlinks, it’s time to build some. But before building links you need to find the right blog to comment on. The obvious way to do so will be by searching your keyword in Google and then filtering out the sites. 1) Spying on competitor: Probably the easiest way to find blogs for not only commenting but for any other type of link building as well is spying on your competitor or stealing his backlinks. For doing so you need to use any of the available tools and check the backlinks profile of your competitor. Then from the list choose the sites which are relevant to you and use them to build backlinks. There are lots of paid tools available for checking a site’s backlinks. And if you don’t have money to spend, you can use OpenLinkProfiler which is a good free tool for the same. 2) Google Footprints – The second method to find blogs to build comment backlinks is by using Google footprints or Google Dorks method. If you have never heard of it before let me explain. Many sites have specific words on their pages which indicate a certain type of link building opportunity. So what we do is search for these specific words along with our keywords to find blogs with those oppertuninty. 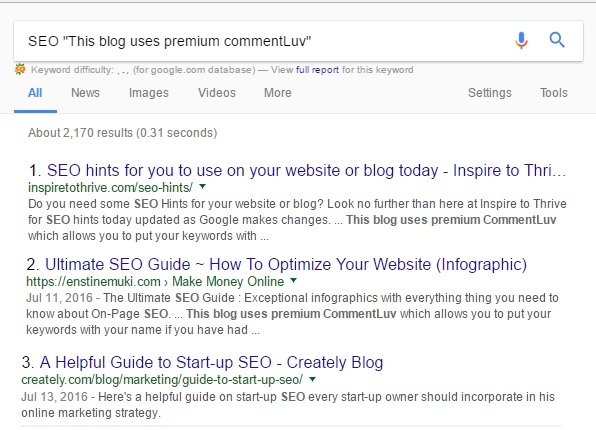 As you can see in the picture above, the results will show you blogs which have CommentLuv enabled which you can use for comment link building. 3) Drop My Link – The third method is not exactly a unique method but only an extension of the previous method. Drop My Link is an awesome site which allows you to find the blogs you are looking for without much effort. All you need to do is sign up for a free account. Then enter your keyword in the given box and choose what kind of link building opportunity or blogs you are looking for from the drop down menus. Now just click on the search button and it would automatically perform the search using required Dorks to find your desired blogs along your keyword, making the whole process much easier. Now below are list of most awaited thing!!! High PR commenting sites. Remember that while comment backlinks can be an essential part of your link building strategy, they alone are no enough to rank a blog. Also, the frequency of comment links should be adjusted according to the blog you are making and the difficulty of the keyword. For example, if want to rank an event blog, you need to start building at least 10-15 links per day from almost any kind of blog, around 2 months prior to the event. On the other hand, if you are trying to rank a micro niche site, you should build 4-5 highly contextual links each week. Did you enjoy reading this article? Do you still have any questions left? What other guides would you like to read from us? Do let us know your thoughts in the comments section below. Really high page ranked do follow link are really helpful for a website to rank high. From my point of view, this article really helps for a beginner like me. Thanks for it. I knew the concept of footprints and Google operators before, but I’ve only used them to find guest posting opportunities. Didn’t thought of using them to find blog commenting opportunities as well. Thanks for sharing valuable knowledge, and also the list of sites that accepts blog comments. Blog commenting is the best and easy way to make quality links quickly. I already used Dropmylink to find your blog too, here i learned other ways to find niche blogs to comment. Your list is really helpful for any newbie. i just discovered recently that blog commenting is the best and easy way to make quality backlinks quickly. I used Dropmylink to find your blog, and here i have learned other ways to find niche blogs to comment. Your list is really helpful for any newbie like me. Link building is one of the most important strategies to drive traffic and increase the authority of a site. Thanks for sharing this lists for link building! Yes, It takes few days to collect the whole list and updating regularly. Great blog commenting list, It’s really so helpful for off page SEO. Thanks for sharing the list. It is sometimes difficult to find a collected list as you have done. You must have trust in your staff and be able to depend on them. I have a great team, and even the people I find myself subcontracting with I can trust. thanks for the list of blog commenting site glad it was really heplful ..
Amazingly informative and helpful post.everything is good enough and website is very well designed well! week writing stay blessed.It was very interesting for me to read that blog. Thanks the author for it. I like such topics and everything that is connected to Search Engine Optimization. I would like to read more soon. I loved your article; it’s exceptionally authentic and straight to the point. Much aided to you for setting aside your little opportunity to share out such knowledge and clear directions through such online journals for nothing. Stay aware of the great work.Amazingly informative and helpful post.everything is good enough and website is very well designed well! week writing stay blessed.It was very interesting for me to read that blog. Thanks the author for it. I like such topics and everything that is connected to Search Engine Optimization. I would like to read more soon. Excellent post. I am familiar with dropmylink and that’s why I reached on your site. But I never heard of most of your tips including Google dorks. It is a great method to find high quality backlink building opportunities. Hmm.. Great post and information. I have been using few other tools like dropmylinks and comment luv blogs finder. Wonderful list of blog commenting sites. Thanks for sharing with us! Thanks for sharing the list. It is sometimes difficult to find a high pr list as you have done. Link building is one of the most important strategies to drive traffic and increase the authority of a site. Really an awesome and informative blog about blog commenting. After reading this blog, I got some excellent blog commenting tips and tricks which will help me in future to expand my online website presence. Keep it up and we want to more like this from you. Thanks for sharing, I have always struggled to find Edu and Gov backlinks. Thanks again. Very Informative Artical we get a lot of information and we really appreciate your team work keep it up. Nice commenting list, It’s really so helpful and i hope to get several benefits from it interms of google ranking and link juice. Your blog is really an awesome and informative one about blog commenting. hope i will get more backlinks and more google rankings. Excellent post. I am samilar with dropmylink and that’s why I reached on your site. But I never heard of most of your tips including Google dorks.I like such topics and everything that is connected to Search Engine Optimization(SEO). I will choice to read more soon. thanks for making web site. Using DROP MY LINK website is a good option to visit those websites those allow to link a comment. Thanks for sharing nice tips. Back link building remains the number one method to boost traffic and increase the cost of advertising on a blog. Back link building is one of the long term strategy that every blogger needs to look upon in order to be successful. I am wondering of this still works. Most of such lists that I have come across either don’t work or have converted themselves to a no-follow back link. How fresh and authentic this list is will have to see and find out. very good list ,it helped me alot. While searching on google about High PR Do Follow Blog Commenting Sites List I found your website. Your article about High PR Do Follow Blog Commenting Sites List is really amazing. Love the way you mention the whole list about High PR Do Follow Blog Commenting Sites List. Keep up the good work mate. Thanks for creating such a nice post, a good data for every beginner of High PR Do Follow Blog Commenting Sites List. Thanks for creating such a nice post, a good data for every beginner of High PR Do Follow Blog Commenting Sites List. Great job this is the very well explained and filter with PR website list thank you so much for the sharing it is very helpful for me. Hii this high pr site is really very osm and effective for the website. Google always follow quickly high pr sites and this sites are really good for website ranking. Hi it is really a very huge collection of blog commenting sites list for getting SEO backlinks. Thanks for sharing this information…. Its very informative information. SEO bacllinks very important for the improving site ranking. Thanks for sharing this article helps me a lot. This is very useful website , you have given every thing about blog commenting as well as site names of blogs. Thanks a lot for sharing this nice list. Im sure it will definitely help us to make do follow backlinks. Great list of do follow blog commenting sites.Thank you so much for sharing this post and we will try to keep touch with your site. Very well explained about how to create a backlink. Suggestions posted by you is really helpful for beginner’s like me. Excellent! Keep continue your good work. we will start following all those links mentioned in your article. High PR Do Follow Blog Commenting Sites List is really amazing. Love the way you mention the whole list about High PR Do Follow Blog Commenting Sites List. Keep up the good work mate. Thanks for creating such a nice post, a good data for every beginner of High PR Do Follow Blog Commenting Sites List. Looks like, Google has updated its algorithms and no more considering Page Rank as a factor. Hi Pankaj, These all blog commenting sites are very good in terms of quality and shared very informative tips that find this kind of sites in starting of an article. Thanks. I have been working on high pr dofollow commenting and it seems effective, though it takes some time for Google to index such links. Thanks for sharing this list. Really nice information. I have been searching for information about what you have shared. It helps me for creating backlinks easily. Thank you very much. Thanks for sharing this amazing list of back-link . All these are really helpful for me. all site are very good working such a very understandable site thanks once again. Nice one … awesome site list. thank you for sharing best commenting site list. this is very really helpful. r sharing this useful blog’s list. This makes us easier to find the blog we need. Really a great list, thanks for sharing. Very very important for everyone who wants to post article. I think your article is very interesting and appropriate for me to try, and I want to ask how do I check the backlinks of quality using free seo tolls? I have check all this out and most are working… it will help me as a new seo worker.. Thanks for sharing..
Great post, interesting read and valuable information. I’m currently testing the links for page rank, quality and quantity of visitors.hope your readers realize the value of what you have just provided. These back-links are crucial if one’s blog is going to rank at all. Or more rankings from Google. Please keep posting such great stuff and we love you. very interesting site all site are very wonderful thanks for sharing a wonderful site please keep it up.Really nice information. I have been searching for information about what you have shared. It helps me for creating backlinks easily. Thank you very much. Great post and thanks in advance! Pankaj Sir, This is great post I read ever for back links by comments. And this is truly mind opener. Before I read this I don’t properly that how to comment for backlinks, I am also doing same thing but not satisfied or confirmed by my way. And I don’t about Disqus that how I can use it for backlinks. Drop my Link is also nice website. And Google footprint really I telling you never heard before. All Dorks ideas are also very nice. Thank you so much for here you shared just amazing list of Blog Commenting sites. I’m submitting my first Blog Commenting today and you’ve provided just what I need. I appreciate you.I think Blog commentingis the strong backlinks compared to others submission like comment and directory. Although thanx for sharing. very helpful and useful back link creation sites. Thanks for sharing such an amazing blog post. I have tried these all an my SERPs increased gradually.